The K9 Storm Aerial Insertion Vest is a mesh vest that provides a built-in load bearing harness system proof load rated to 2,500 lbs. The K9 Storm Aerial Insertion Vest enables the canine to be lifted into attics or over barriers, lowered into crawl spaces or ship hulls, and rappelled down walls or fast-roped from helicopters. It is ideal for drag line extractions of non-compliant suspects as well as insertion tactics including sky diving. 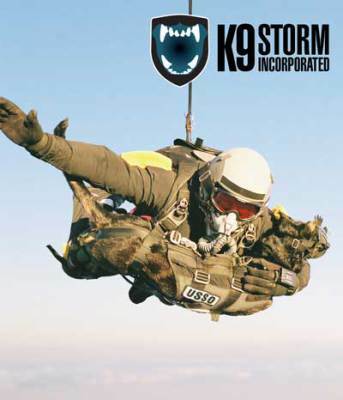 The K9 Storm Aerial Insertion Vest has two silent kelvar V-Rings for dogs of war that are deployed on parachute missions. 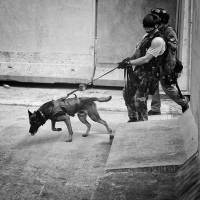 K9 Storm--the canine force protection equipment of choice for Military Special Operations Teams in many countries. 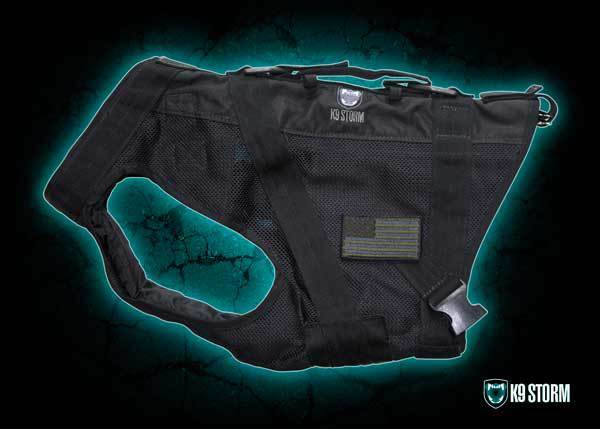 Follow the link for more info on our Aerial Insertion Vest Options.